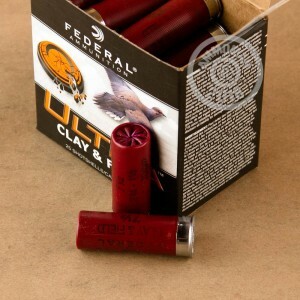 Never fear shotgunners, Federal is here to save you time and money with these multipurpose 12 gauge shells from the Ultra Clay & Field line. 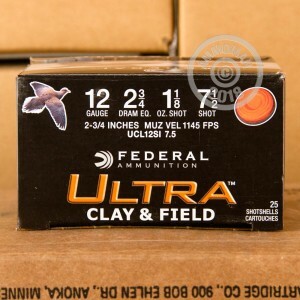 These versatile shells contain 1-1/8 ounces each of #7-1/2 size lead shot which is appropriate for upland birds as well as featherless clay pigeons in flight. The shot is contained within a plastic hull with a spiraling crimp which protects the insides from moisture. The lead pellets are hardened for deeper penetration into quail, pheasants, and the like, and rest upon a cushioning wad which helps to mitigate recoil. A 2-3/4 inch hull length maintains compatibility with combat or turkey pieces on stand-in duty and is also optimized for the highest shelf of fouling and sporting shotguns' typical chamber length. A slick, low head helps keep costs down without compromising extraction from semi-automatic and pump-action guns or ejection from over/under and side-by-side scatterguns. Each head is accompanied by a clean-igniting primer that won't leave any harmful salts or chemicals behind in your favorite 12 gauge. Federal Premium ammunition has been impressing American Olympic shooters, law enforcement agencies, and hunters since the early 1920s. Buying in bulk with this 250-round pack will net you a matched lot of uniform performance at an attractive price. The entire package breaks down into ten separate 25-round boxes for convenient separation.